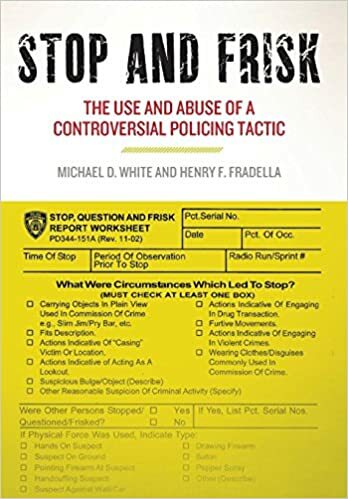 STOP AND FRISK: THE USE AND ABUSE OF A CONTROVERSIAL POLICING TACTIC, by Michael D. White and Henry F. Fradella. New York: New York University Press, 2016. 256pp. Cloth $23.53. ISBN-10: 1479835889. Reviewed by Jeffrey Ian Ross, University of Baltimore. Email: jross@ubalt.edu. This book, consisting of six chapters and an epilogue, written by White and Fradella, two well respected criminologists and policing scholars at Arizona State University, examines the history of stop, question and frisk (SQF) in the United States, and the legal cases and scholarly research connected to this practice. In short, the writers review how in some cases stops by law enforcement officers are more or less serious and whether the evidence collected because of the stop and arrest of the individual can be admissible in a court of law. In Chapter 1, “Two Tales of Stop and Frisk,” the shortest chapter, the authors analyze the infamous TERRY V. OHIO case (1968), which, according to the authors, “formalized the authority of the police to stop citizens on the street based on a standard of proof lesser than probable cause, and it also gave them the right to conduct superficial ‘pat down’ searches of those citizens whom the stop…” (p. 2). One of the reasons for focusing on this practice is because “the term ‘stop and frisk’ has in many places become synonymous with racial profiling” (p. 7). White and Fradella state that, “The central focus of this book is the disconnect between current perceptions of SQF as a form of racial discrimination by police and the strategy’s historical, legal, and discretionary foundations” (p. 8). The writers end the chapter by arguing that, “in twenty-first century policing, SQF should be assessed in terms of both legal … and procedural justice standards” (p. 15). Chapter 2, “The Historical Context,” outlines the history of SQF. This chapter reviews important court cases and the differences in the burden of proof practice. This part of the book outlines the relevant components of the Fourth Amendment (which protects citizens against unreasonable search and seizure). The authors state that, “The Reasonableness Clause of the Fourth Amendment limits government authority to conduct ‘search and seizures,’ but does not define what those terms mean” (p. 24). They also analyze the Uniform Arrest Act that was introduced in 1939. Chapter 3, “The Contemporary Legal Context,” examines research on implicit bias and “the free to leave test.” It also considers the notion of “furtive gestures” as a pretext for stops. The authors review numerous court cases that relate to SQF. White and Fradella argue that, “TERRY and most of the SQF cases decided since 1980 collectively ignore the fundamental problems with using a low standard of proof that invites the use of racial, ethnic, and socioeconomic class stereotypes as part of a calculus of suspicion” (p. 78). Also examined are three important Supreme Court decisions: TERRY V. OHIO, SIBRON V. NEW YORK, and PETERS V. NEW YORK. These “cases adopted formal rules governing police-initiated street encounters with citizens under circumstances amounting to less than full arrests” (p. 44). The authors also look into the notion of implicit racial bias (pp. 64-65). They state, “unconscious cognitive processes often lead people of all races to view young Black men with suspicion” (p. 65). “Crime-Control Benefits and Collateral Consequences“ (Chapter 4) mentions that, “Since the 1968 decision in TERRY V. OHIO, stop and frisk activities have become an important crime-fighting tool for many police departments across the United States…. Despite the widespread adoption of SQF, the consensus about its effectiveness in reducing crime is mixed” (p. 81). The authors provide a history of stop and frisk policy and practice in New York City and lament the fact that somewhere around 70 percent of all SQFs are not recorded on forms. They argue that, “Many scholars have argued that the excessive use of stop and frisk [*74] has come at the cost of racial and ethnic tension, compromised police legitimacy, and devastating effects on citizens’ emotional and physical well-being” (p. 99). The researchers document similar practices in other big American cities, the scholarly research that was produced after controversial incidents, and the legal cases that followed. The chapter also reviews the 2013 FLOYD, ET AL. V. CITY OF NEW YORK case (a class action suit filed against the city of New York, the mayor, police commissioner and a handful of policing officers alleging that street stops violated not only the constitution, but other legal statutes). Chapter 5, “Beyond a Few Bad Apples,” examines, through a review of scholarly research, how the careful selection of police personnel, important subtleties of training police officers, and the necessity of appropriate administrative policy, “supervision, accountability, and commitment from” the leadership of the police organization, and external oversight relates to the practice of SQF. Each of these factors or processes, if done properly, can increase the likelihood that police use “discretion in an appropriate an just manner when making Terry stops” and minimize “stopping citizens based on race/ethnicity or some other extralegal factor” (p. 117). In Chapter 6, “The Future of Stop and Frisk,” the longest chapter in the book, the authors provide a history of policing that builds on the classic article by Kelling and Moore, with a standard critique of this rendering. They move on to Tylers’ notion of procedural justice as it relates to policing of citizens. White and Fradella endorse the findings of the 2015 President’s Task Force on policing and suggest that the “report provides a road map for better policing in the United States” (p. 161). They state that they want to know “the proper role of stop, question and frisk in collaboration with the various strategies that police departments will employ as part of twenty-first century policing” (p. 161) and spend the balance of the chapter examining this. The book then outlines SQF in the context of community policing, hot spots and targeted policing, offender strategies, and the introduction of police body cams. The book ends with a very short Epilogue that contextualizes the factors that led up to the FLOYD case, the judicial decision that followed, and remedies that are being implemented with the NYPD. The authors suggest that this New York City case is generalizable to the rest of the United States. There are four major drawbacks to STOP AND FRISK: THE USE AND ABUSE OF A CONTROVERSIAL POLICE TACTIC. First, there is a considerable amount of needless repetition of the basic ideas throughout the book. For example, in Chapter 5 the authors state, “At its core, stop and frisk is an exercise in police discretion. An officer witnesses something that generates reasonable suspicion” (p. 117). This comes after this statement is made repeatedly throughout the book. Second, there is some tendency towards overgeneralization. For instance, White and Fradella mention, “The police relationship to the external environment is defined by collaboration with the community and a host of other stakeholders, including external researchers” (p. 155). Yes, in a perfect world this would make sense, but in most jurisdictions this is a hope or wish rather than a reality. Third, STOP AND FRISK includes long swaths of quotes from court cases that are not really necessary. This is particularly acute in Chapter 3. Fourth, the book goes on at length on matters like the history of policing. Although appropriate for an undergraduate text, in a scholarly book such as this, the attention given to this kind of subject matter is not necessary. Finally, although one might criticize the authors for their disproportionate focus on policing in New York City, in law enforcement circles, NYC is typically seen as a lightening rod for challenges in policing in the United States and a testing ground for new policies and practices. In other words, if a policing challenge exists in the [*75] big apple or an innovation (e.g., Compstat) can work there, it might be able to work in other jurisdictions. All in all, this book has a handful of major contributions. Most importantly STOP AND FRISK comprehensively reviews the history and practice of SQF, the complicated legal history connected to it, and almost all relevant research on the policies and practices surrounding SQF. White and Fradella point out the policies and practices that have generally led to the selection, training and employment of officer who are most likely to use their discretionary authority in an appropriate manner. The authors also point out significant subtleties that are often lost on criminologists and policing scholars when addressing SQF. White and Fradella note, “Discerning any precise point at which the law distinguishes between reasonable suspicion and probable cause is impossible” (p. 31). SQF has been a hotly contested subject in the news and social media, among law enforcement practitioners, in legal circles, and in selected academic field too. SQF is an important subject matter worthy of an in-depth analysis and White and Fradella have successfully accomplished this task. PETERS V. NEW YORK, 392 U.S. 40 (1968). SIBRON V. NEW YORK, 392 U.S. 40 (1968). © Copyright 2018 by author, Jeffrey Ian Ross.